Update December 2011: Kevin helped us out with some equations for the equal-split case. Bravo! This idea for this content was contributed by Chris Owen, who designed this cool splitter. No where else in the universe but Microwaves101 will learn about this, thanks to Chris who chose to "publish" it here! Update October 2010: Looks like MiniCircuits now markets an Owen splitter. Someone there must have read about it on this Microwaves101 web page! Look for part number ZFRSC-123 on this page. Here's an example of an Owen splitter. The Owen splitter provides multiport capability (2-way to N-way), with unequal splits possible to any of the ports. Like all resistive splitters it offers wideband performance. 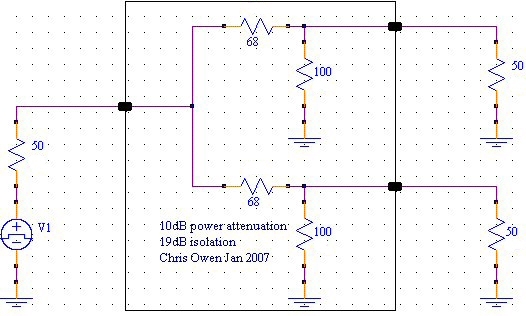 What sets this splitter apart from others (wye, delta, and the Adams splitter) is that the Owen splitter achieves maximum output to output isolation because none of the resistors are in the common path. In this respect there is no better resistive splitter! Like all resistive splitters, the only limitation on bandwidth is due to parasitic elements, there is nothing intrinsic to the design that would limit bandwidth. It is simple to expand the design from 2-way to 3-way to 4-way to N-way. But with increasing N, the efficiency is reduced. Like all resistive splitters, you will incur "real" loss when you use it. It is actually lossier than classic wye and delta resistive splitters described here. It provides better isolation between split ports than classic wye and delta splitters. It provides a means to vary the voltages of the signals of split ports, so it can be used as an unequal splitter. 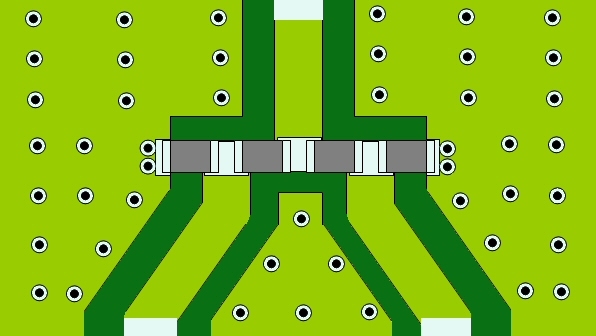 We envision this design as a wideband equal splitter on a thin-film or thick-film chip, with 2-way, 3-way and 4-way versions. Anyone interested, give us a shout! In a semiserious fashion I wish to lay claim to the Owen Resistive Splitter (similar to the Wilkinson splitter!) if it hasn't already been claimed, I have never seen it elsewhere. This particular resistive splitter design provides 10 dB power loss from the input to both outputs, maintains 50 ohms match on all ports, AND provides 19 dB of isolation between each of the splitter outputs. This splitter design may be useful for wideband applications (dc to 18 GHz!) where attenuation is not an issue and where a little isolation is useful and where simplicity and low cost and low space are also important. Chris's splitter is based on L-pad attenuators. 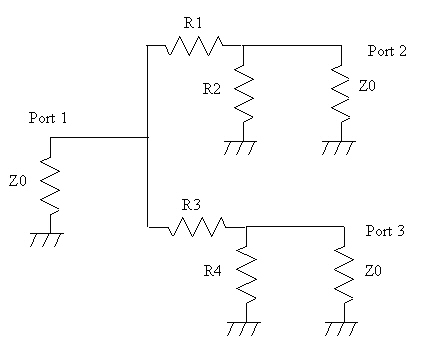 Below is a schematic for a 2-way Owen splitter with the ports defined. Port 1 is the common port, as a divider this is where the incident signal enters. We'll use this resistor nomenclature (R1, R2, R3 and R4) in the analysis below. Most often the coupling factor is expressed in dB, which is 20xlog(CF). PF in dB is 10xlog(PF), at which point the coupling factor and power factor are identical. The isolation from port 2 to port 3 is merely the sum of the coupling factors of these two ports (you can prove that for a homework!) This is why the Owen splitter offers the maximum isolation of any resistive splitter. 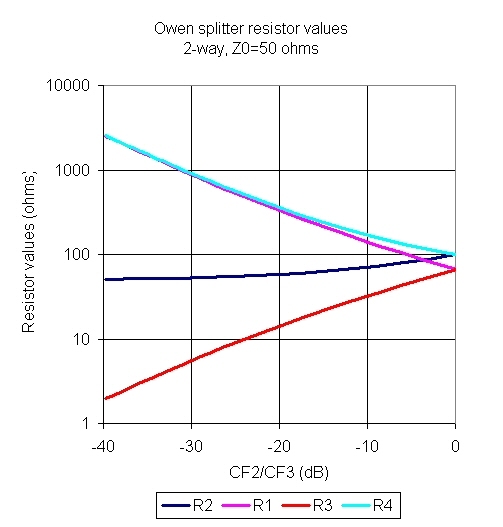 Below is a table of coupling factors, isolation and resistor values for 2-way Owen splitter (Z0=50 ohms). Looks like you can never get less than 19 dB isolation with the Owen splitter! You can't say the same thing about the Wilkinson splitter. The efficiency ( ) is theoretically equal to 100% when all of the power is coupled to one of the arms (which would not be a useful coupler.) Efficiency bottoms out at about 22% for intermediate coupling values. Update August 2007: previously the data in R1 and R2 columns was inadvertently reversed, it's fixed now. Thanks to Robert! Here's an excellent layout for a "wideband" two-way Owen splitter, this image was contributed by Chris Owen himself. Note that the four resistors are all located as close to each other as possible, and as close to the common node as possible. Any significant track length between the resistors acts as distributed transmission line which will cause a phase shift; at higher frequencies the increasing phase shift will eventually skew the response (coupling factors will shift and port VSWRs will increase). At some frequency any transmission line will become 1/4 wave and then all bets are off! The grey/black circles represent vias that tie the backside ground to the topside grounds. Here's the values for R1 and R2 for N-way splitters in 50 ohm system. We also show the "coupling factor", which is the ratio of arm output to splitter input power (we'll post that equation later). Yes, it is possible to create an N-way Owen splitter with output arms set to different coupling values. Rather than trying to solve for the resistor values algebraically, we recommend you use an optimizer to do this job for you.